GAO-17-75: Published: May 15, 2017. Publicly Released: May 15, 2017. The internet has gone well beyond computers to affect everything in our daily lives—from our cars to our baby monitors to our…toasters. The Watchdog Report Big Bite edition podcast goes on location to talk about what all this connectivity means for consumers, jobs, and the economy. 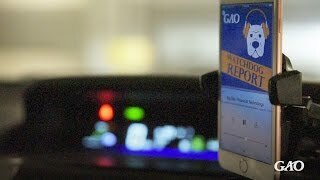 To hear more GAO Watchdog Report podcast episodes, subscribe using the iTunes and RSS links on the right side of this page. The internet has gone well beyond computers to affect everything in our daily lives—from our cars to our baby monitors to our…toasters. We’ll talk about what all this connectivity means for consumers, jobs, and the economy. The Internet of Things (IoT) refers to the technologies and devices that sense information and communicate it to the Internet or other networks and, in some cases, act on that information. These “smart” devices are increasingly being used to communicate and process quantities and types of information that have never been captured before and respond automatically to improve industrial processes, public services, and the well-being of individual consumers. For example, a “connected” fitness tracker can monitor a user’s vital statistics, and store the information on a smartphone. A “smart” tractor can use GPS-based driving guidance to maximize crop planting or harvesting. Information security. The IoT brings the risks inherent in potentially unsecured information technology systems into homes, factories, and communities. IoT devices, networks, or the cloud servers where they store data can be compromised in a cyberattack. For example, in 2016, hundreds of thousands of weakly-secured IoT devices were accessed and hacked, disrupting traffic on the Internet. Privacy. Smart devices that monitor public spaces may collect information about individuals without their knowledge or consent. For example, fitness trackers link the data they collect to online user accounts, which generally include personally identifiable information, such as names, email addresses, and dates of birth. Such information could be used in ways that the consumer did not anticipate. For example, that data could be sold to companies to target consumers with advertising or to determine insurance rates. Safety. Researchers have demonstrated that IoT devices such as connected automobiles and medical devices can be hacked, potentially endangering the health and safety of their owners. For example, in 2015, hackers gained remote access to a car through its connected entertainment system and were able to cut the brakes and disable the transmission. Economic issues. While impacts such as positive growth for industries that can use the IoT to reduce costs and provide better services to customers are likely, economic disruptions are also possible, such as reducing the need for certain types of businesses and jobs that rely on individual interventions, including assembly line work or commercial vehicle deliveries. The rapid, global proliferation of IoT devices has generated significant interest. In light of the current and potential effects of the IoT on consumers, businesses, and policy makers, GAO was asked to conduct a technology assessment of the IoT. This report provides an introduction to the IoT and describes what is known about current and emerging IoT technologies, and the implications of their use. To conduct this assessment, GAO reviewed key reports and scientific literature; convened two expert meetings with the assistance of the National Academies; and interviewed officials from two agencies to obtain their views on specific implications of the IoT. Ten federal agencies and twelve experts reviewed the draft report and some provided technical comments, which were incorporated as appropriate. For more information, contact Nabajyoti Barkakati at (202) 512-4499 or barkakatin@gao.gov or Mark Goldstein at (202) 512-6670 or goldsteinm@gao.gov or Gregory Wilshusen at (202) 512-6244 or wilshuseng@gao.gov.